Day 219 – A Fun Day Yesterday! Yesterday Tony and I put the top down on the car and drove up the hill to Chukchansi Resort for a nice buffet lunch. It was really good….we had mostly Chinese food….I threw an enchilada on my plate too….Tony added some Mexican corn to his plate of Chinese food. The hot and spicy soup was REALLY good! After lunch we drove a few miles down the road to Bass Lake and had about an hour to kill before we needed to take off for the melodrama. We thought we might go on a boat ride, but found out when we got there that they only have one ride on Saturdays….at 11 a.m. So we missed that. 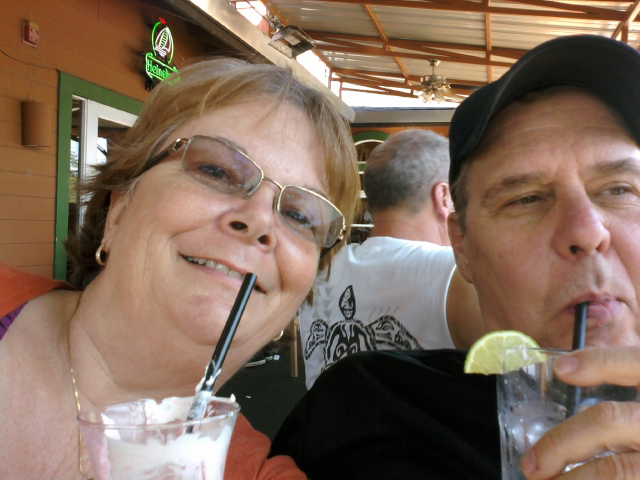 We decided to go to the patio bar and grill and have a couple of margharitas and daquiries and just relax for a little bit. The patio is on the 2nd floor overlooking the lake. We watched a momma duck and her 6 babies swimming around the edge of the lake in front of us. Those little ducks were so cute. I was hoping to see an eagle…..but we didn’t see one this time. Here’s a pic of Tony and I on the patio enjoying our drinks! We had fun and did a lot of laughing at the melodrama too. The villain was really funny and if we didn’t boo or hiss loud enough, he would face his palms toward us and wiggle his fingers egging us to cheer louder right then and there….or he would say something like. “Aren’t I EVIL enough for you? !” Making everyone boo and hiss louder, amidst lots of laughter! After the show we put the top down on the car again and drove home in the cool evening air with the stars right there with a glance toward the skies. It was a heavenly day!!! This entry was posted on Sunday, August 7th, 2011 at 5:39 pm and is filed under Uncategorized. You can follow any responses to this entry through the RSS 2.0 feed. You can leave a response, or trackback from your own site. 2 Responses to Day 219 – A Fun Day Yesterday! We had the best day! It was so much fun! So relaxing!